Yes he is and I got to witness it live tonight and then meet him. I’ve been a fan since first discovering Ren & Stimpy however many years ago. 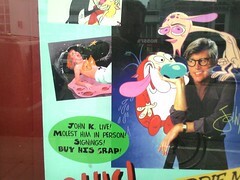 Tonight John K came to the Castro Theater in SF to present a bunch of rarely seen and some banned cartoons that the networks never let him air. The Adult Party episode of Ren & Stimpy was pure brain breaking genius from start to finish. It’s also on the recently released Lost Episodes DVD . Just two words: touch tip. 3 more shows tomorrow/Saturday. An afternoon kid-friendly show at the Castro, an adult one in the evening and a gig at the Cartoon Art Museum where John might draw you some twisted knowledge. Stay up to date with Kricfalusi’s world on abundantly updated blog.